Vermont has a great wealth of farm products, and natural resources. That is what makes it such a great place for cooking. With the access to fresh ingredients and the participation in one of the state’s excellent cooking classes, you’ll be a Master Chef in no time. Here are the 10 best cooking classes in Vermont! When you sign up for a class by Chef Contos, you get a passion for food you do not find everywhere. She has on a mission since 2000 to bring back the joy of home cooking, and she is a big proponent of kitchen fundamentals and vegetable gardening. Eighty percent of her products are organic and locally sourced. Each class accommodates up to eight students, and you can feel free to bring wine or beer. Class participants receive a 10 percent discount in the store the day of class. As the former Executive Chef at the New England Culinary Institute, Chef Robert is passionate about teaching culinary arts. During classes, he generously shares his classic techniques with students and home chefs of all abilities, and although participation is always encouraged, students are also welcome to relax and observe while sipping a glass of wine… or two! Classes are held at Café Provence, and, when finished, students have all the information they need to replicate dishes at home. The on-site cooking class program at the Essex Resort gives you a chance to work with renowned chefs in a fun atmosphere an intimate classroom kitchen. Students enjoy a low-pressure, hands-on culinary experience and learn new techniques. Children are also welcome, and they are encouraged to participate in food preparation and food nutrition classes. Plus, during Camp Cook campers will pick seasonal herbs and vegetables from on-site gardens and collect eggs from the chicken coop. Each month, City Market offers fun and inspiring food and wellness classes taught by local instructors! They offer classes for kids and parents, so sign up for a food or education class today. Also, find information on medicinal herbs, natural sweeteners, and wild edibles, plus cooking tips, recipes, and more. King Arthur Flour offers cooking classes at their Baking Education Center. Offering kids classes, professional level baking, and home baking classes, the Baking School welcomes all bakers, no matter the skill level or baking interest. Classes range from introductory demonstrations for beginners to intensive week-long professional courses, with a wide variety of hands-on classes for adults and children. 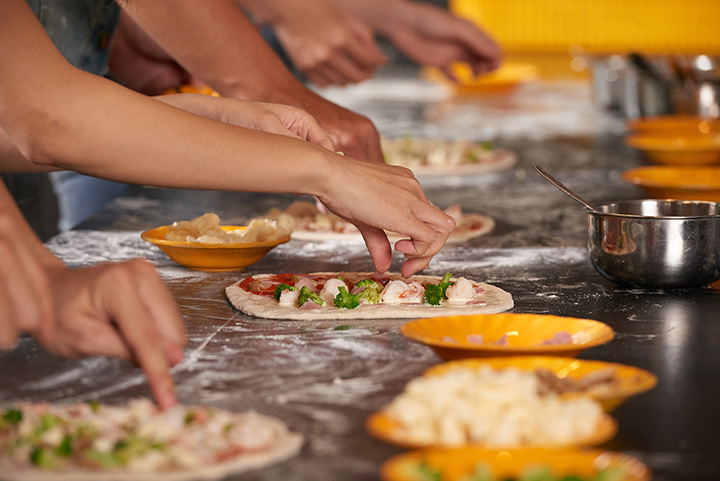 Load your own pizza during the“Top This,” class at King Arthur Flour’s Baking School. Culinary classes allow both parents and children learn new culinary skills, have fun making their family’s dinner together, and work in a commercial kitchen setting with professionally trained chefs. Every week, you have the option to make a three-course dinner including dessert. Some of the skills covered in class are grilling, sautéing, knife skills, and baking. At the end of each class, you will take home your creations and share what you have learned with the rest of the family. At Healthy Living, they encourage kids to take an active role in what they eat. Kids take hands-on classes, like root beer float cupcakes, salsa, and corn on the cob, at the Learning Center. In addition, the community outreach program is devoted to helping local non-profit organizations. With, a special interest in environmental issues, building healthy communities, and making health a priority, Health Living knows what cooking is all about. Offering in-home catering, personal chef & private chef services Thyme 2 Dine is a mobile business serving the Stowe area of Vermont. Chef Larry Cornblatt provides personal chef services, including weekly/bi-weekly meal plans, vacation services, catering for all occasions, and cooking classes. Chef Larry can teach you anything from kitchen basics to international cuisine and complete gourmet meals. Cooking with Chefs at the Inn offers a large selection of classes. In the afternoon, participant can work directly with the chef for 3-4 hours at the inn’s large country kitchen. Prepare recipes for the weekend’s course and be as hands-on as you like, or maybe sip a little wine and just watch. There are also tips, shortcuts, and professional techniques to be learned, as well as a complete recipe book for each participant. Have you ever been chronically ill or maybe you have worried about the health of a loved one? Would you like to reduce your stress level, or lose weight? Do you wish you had more energy? Let Chef Lisa teach you how to implement doctor-prescribed food protocols and eat healthy.